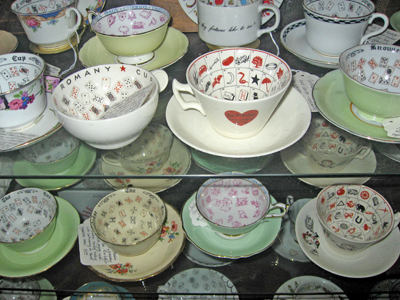 Here is a sampling of some of the fine vintage Fortune Telling Tea Cups we sell in the Lucky Mojo Curio Co. shop. Because these are very rare (albeit not one-of-a-kind) it's a good idea to call the shop and inquire about availability and prices. There are one or two that I would absolutely love to add to our collection. Drool-worthy, indeed! I feel lucky to have seen that Not For Sale tea pot as well. Right place at the right time. Thank you for sharing this picture to make my brain fondly remember the tea cup shelves! If you find that you may have an interest in reading tea leaves, is it best to do some research and read up on the practice first? And then, what aids you in selecting the appropriate cup? The ones sold at Lucky Mojo are designed in a way that the tea leaves sit well make associations with other symbols (inside the cups) and have a better outcome of visualizing the symbols. They are vintage. And therefore, what the expert "old timers" used. If you're learning the art, wishing you the best and PLEASE share your outcomes with us! I just bought a vintage 1985 Royal Kendall tea reading cup but how to use it? We sell a full-colour facsimile reproduction of the instruction booklet. Not a highly pupolar item, because of the cost of hand-making each one, but here it is! Since I am in this thread I thought I would drop this here: I have had nothing but wonderful results when using the Nor-Sun Pu-Ehr loose black tea leaves that Lucky Mojo offers. The leaves are distinct and pronounced, the images seem to pop out quickly, and the tea itself tastes divine. Well worth the purchase. Those look AMAZING!!! tea/coffee ground readings is something I'd like to look into. Right now I'm pretty much starting out about a month into this kind of magic, but have been reading tarot longer than that. Just learned some new spreads. I'll bet you a tarot AND tea leaf reading would give extra awesome insight when contemplating a situation. I love collecting old tea cups. 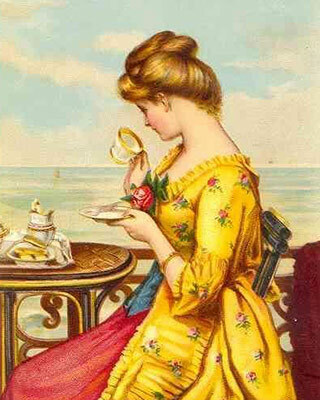 Thank you for posting those wonderful cups and thanks for suggesting the Nor-Sun Pu-Ehr tea I am very interested. Thanks for jumping onto this thread -- it gives me an opportunity to let folks know that my fortune telling tea cup collection is now online in its own space, The Mystic Tea Room! The Mystic Tea Room web site is "built out" in structural form with photos, but not all of the pages have been fully filled with text at this time. Please be patient as i work my way through the tea cups, page by page, and supply more data. Of all the things available for readers, reading tea leaves is what I have always wanted to learn how to do. I'm heading over right now to check this out, because this is truly something I want to learn more about.